Ms Tarja Fernandez, @fernandeztarja, is the Ambassador of Finland to Kenya. Siddharth Chatterjee @sidchat1, is the UNFPA Representative to Kenya. NAIROBI, Kenya, May 22 2016 (IPS) - The 3rd Devolution Conference that took place in Meru, Kenya between 19 and 21st April was an opportunity to discuss how the post-2015 development agenda will be localized and how county governments will deliver on the Sustainable Development Goals (SDGs). President Uhuru Kenyatta has said that devolution is vital in helping the country achieve the Sustainable Development Goals (SDGs). And this is beautifully aligned to Kenya’s own Vision 2030, which is to create a globally competitive and prosperous Kenya with a high quality of life by 2030. Devolution is all about inclusion and participation. 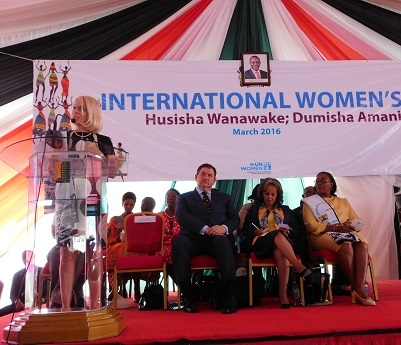 Devolution is therefore also an opportunity to champion gender equality. So the SDG goal number 5, is about, “Achieving gender equality and empower all women and girls” is one of the key drivers of sustainable development. Half of the population should not be left behind. Inclusion of women and girls must be at the core of the development plans will accelerate potential for economic growth and well-being of the societies at large. In order to address gender and other inequalities county governments need to know about them. As was evident with the Millennium Development Goals, data derived from national surveys tend to miss the marginal numbers and thus downplay serious regional disparities, as the averages used in reporting progress mask the suffering of many. For instance, while national data indicates that Kenya’s total fertility rate is 3.9, parts of the country have a total fertility rate of up to 7.8. This represents women who have limited decision making power about when or if they should have children, for reasons ranging from lack of family planning information and services to religious and cultural practices. The Demographic and Health Survey (DHS, 2014) indicates that the national prevalence of female genital mutilation is 21%. However, among the communities where the practice is still intractable, the rates go up to 98%. Clearly, there are populations whose concerns are going unheeded. It is the voices of such populations that county governments have an opportunity to amplify as they seek to find relevance for the SDGs. How can this be done? By providing opportunities for women of all ages to participate in county planning and budgeting processes. Being aware of their rights and listening to their needs. Building county governments’ capacities to analyze gender issues and address them in the County Integrated Development Plans. Sensitizing men on the benefits of providing more space for women to participate decision making, both at home and in public spheres of life. Moreover, including men consistently in discussions related to gender equality. For gender responsiveness to be met, the equity principle must underlie the identification of priorities, planning, budgeting and service delivery. Collecting county disaggregated data will be a key to identification of development needs, and culturally acceptable solutions. In addition, community participation will be crucial to ensuring that the voices of women and girls, the youth and the marginalized, will no-longer be left unheard. Counties now have the opportunity to identify their own priorities and to design service delivery mechanisms suitable for local needs. Each county in Kenya has its own unique challenges and circumstances, but also the resources to solve its problems. Respecting and utilizing valuable local traditions that do not violate human rights can be a rich resource from which development plans can draw knowledge, legitimacy and participation. Though recent surveys such as the DHS 2014 have quality data from the regions, the counties themselves need a lot of support to generate, access and utilize disaggregated data with measurable indicators. As observed recently by the United Nations Population Fund (UNFPA) Executive Director Dr. Babatunde Osotimehin, tackling inequalities and measuring progress towards sustainable development is constrained by a lack of core population data and under-developed capacity to use such data for development. Changing entrenched gender inequalities is, however, not an easy task. There are deep social, economic and cultural forces that drive stereotyping and discrimination and these will not disappear without deliberate actions. These actions by all counties are a key approach to nationalizing the SDGs, reducing inequalities, especially gender inequality, while unlocking the potential that women have for delivering sustainable change. As development partners in Kenya we are committed to work with Government of Kenya and the county authorities to advance gender equality and empowerment.